TERROR NULLIUS is a virtuoso cut-and-paste job that’s both rowdy and precise. 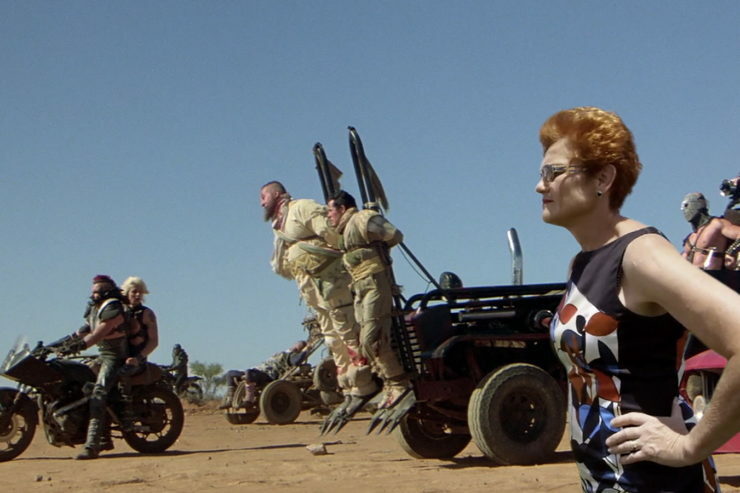 Equal parts political satire, eco-horror and road movie, TERROR NULLIUS is a rogue remapping of national mythology, where a misogynistic remark is met with the sharp beak of a bird, feminist bike gangs rampage and bicentenary celebrations are ravaged by flesh-eating sheep. An intricate remix of Australia’s pop culture and film legacy, Soda_Jerk return with a work that’s dark, hopeful, irreverent and urgent. With directors Soda_Jerk in attendance.